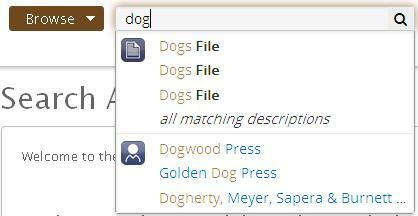 We’ve recently updated our online search to add a few new features. In the last couple of years, we’ve been replacing our old, analogue microform reader-printers with new digital microform scanners. We’d like to show you why researchers like them so much. Microform workstation with Indus 4601-SL scanner. 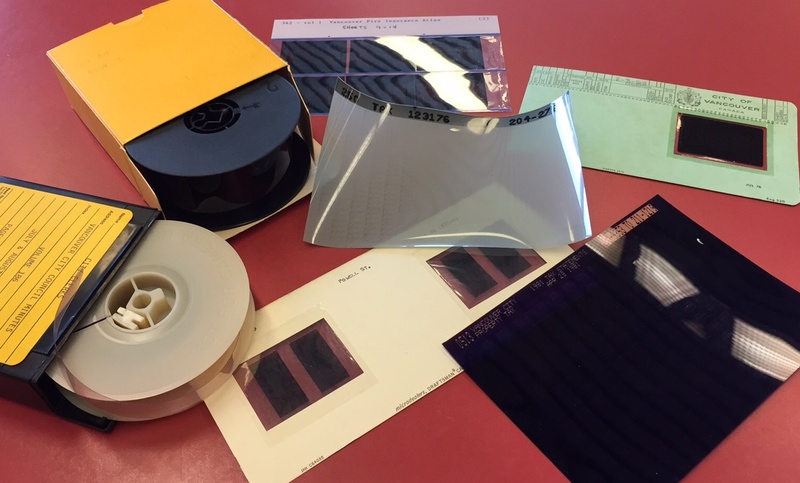 Microforms still have to be used by researchers, as we have hundreds of reels of film and thousands of fiche and aperture cards. These new scanners provide fast and convenient viewing and saving of images. The workstations can be used with many styles of microform and will also scan to file or scan to print. The scanners will work with all these different styles and colours of fiche, aperture card and film. The scanners produce crisp, high-resolution scans and will scan in colour, greyscale or bi-tonal. Images can be cropped and rotated. Scans can be saved in common formats like PDF or TIFF. Screenshot from a fire insurance plan. The workstations have a wireless internet connection, so saved scans can be sent through email or dropped into cloud storage, as well as copied to a flash drive. Note that if you keep a copy of a work that is under copyright to a party that is not the City of Vancouver, you are responsible for obtaining permission of the copyright owner for publication. You may use the copy for fair dealing purposes covered by the Canadian Copyright Act, such as private study. The scanners are attached to 27” monitors to provide a readable full-screen view of maps, plans and other large-format originals. 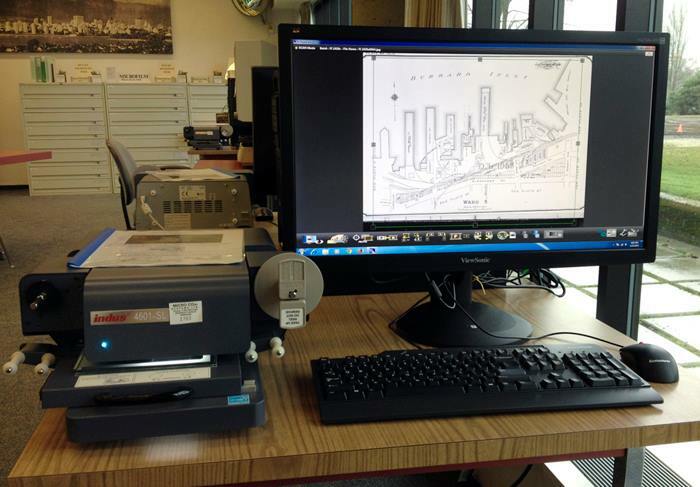 If you have used one of our microfilm scanners, we’d love to hear your feedback! 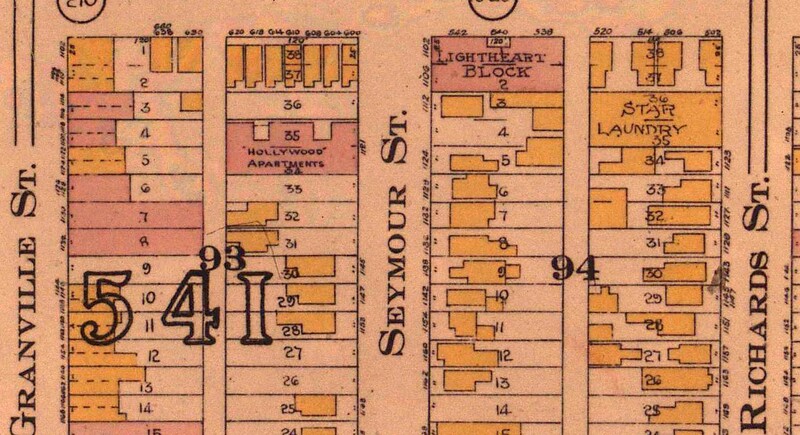 You may have noticed that our SearchArchives database looks a little different. For example, the information for a full record is in a more compact form, reducing the amount of scrolling you’ll have to do. Screenshots of identical dimensions show the dramatic difference. The old version is on the left and the new one on the right. Improved search times. Updates to the search index have reduced the time it takes the database to respond to your search query. Searchable subject and place terms. 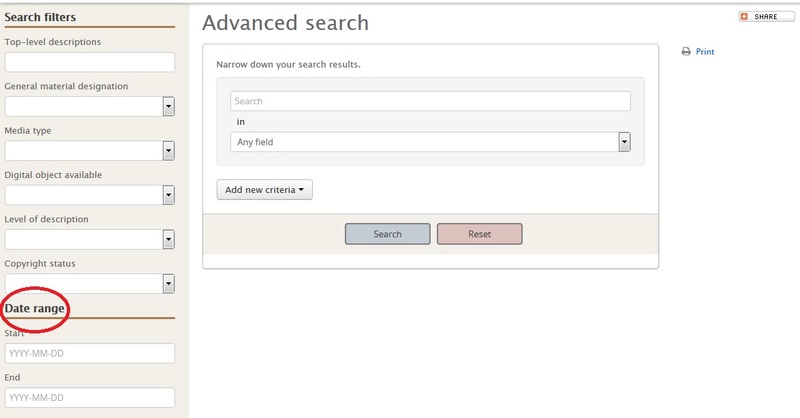 There is a search box that appears on the Browse Subjects and Browse Places pages that allows you to search for specific terms, rather than just browse them. Be sure to hit the magnifying glass symbol (indicated below) to search. 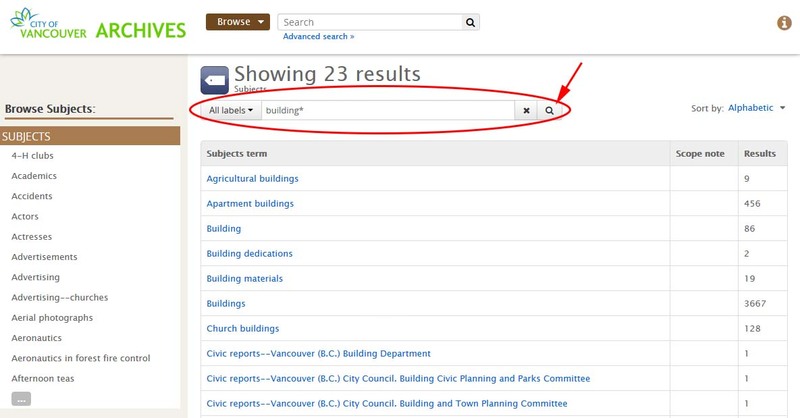 Search results for subject term “building*”. Better list of search results. There has been a change to the results algorithm that will give you results in a slightly different order. 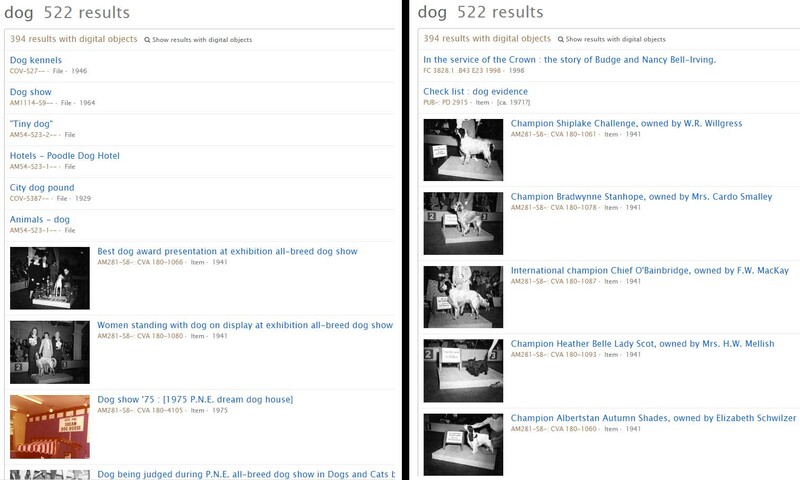 Results of searching for “dog”. The old version is on the left and the new one on the right. 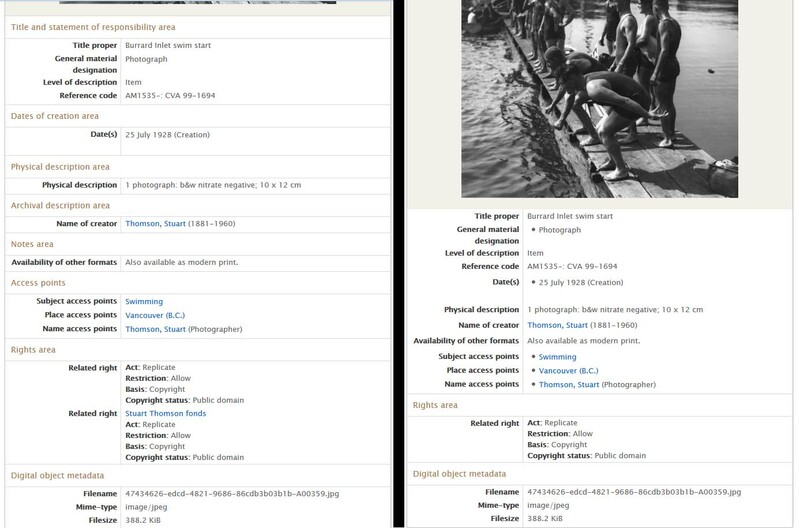 We are anticipating further improvements to our SearchArchives database with the AtoM 2.2 release later this summer. We’ve updated our online search and we think you’ll like the changes in both function and design. Here are some of the main ones. It’s much faster. The search engine is completely new and the difference in search times is noticeable. Simple search gives suggestions as you type a search term. This gives you another way to find holdings. When we first told you about our new search system, we said that it was on a rapid development cycle and that there would be improvements. We’re pleased to tell you about one upgrade that gives you on-site access to thousands more digital objects and another that makes it easier to do research at home. Developed for us by Artefactual Systems, these open source enhancements could be adapted by other institutions using the same database software. And…Action! On set in the Archives Reading Room. 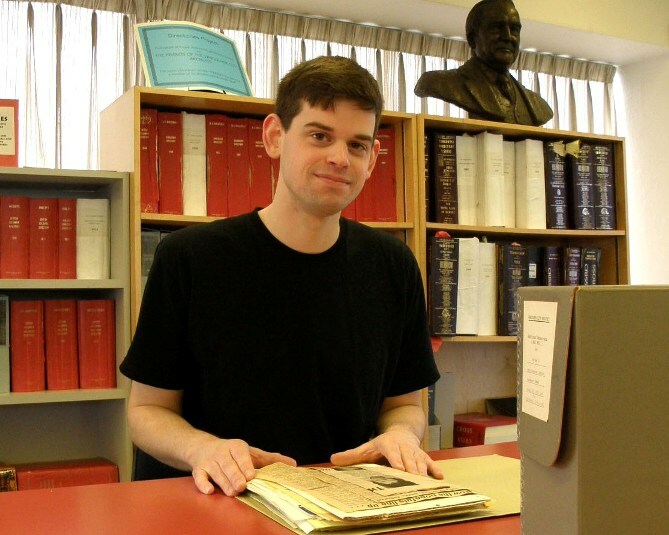 Here at the Archives, we’re used to working with pre-existing documents and media, though we recently decided to try our hand at creating something new. The idea arose to make a video introducing and promoting our public reading room, which is open for anyone to come and conduct research. The first step was to find inspiration. Prior to our new video, proper Reading Room protocol had been communicated through a series of humorous “Dos” and “Don’ts” photos. We loved the way it was fun and tongue-in-cheek while getting the important facts across. 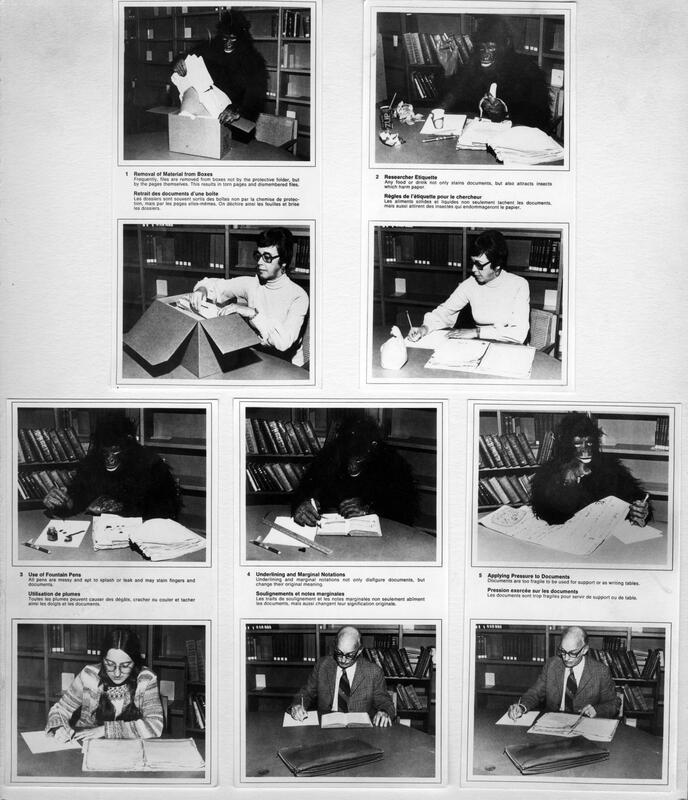 This series of posters created by the then-Public Archives of Canada (now Library and Archives Canada) shows good and bad Reading Room behavior. Don’t behave like the gorilla!